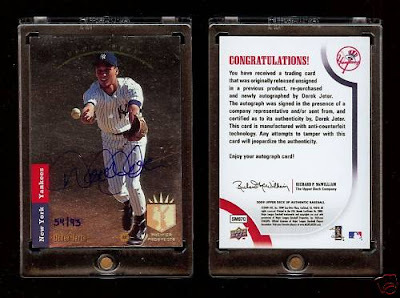 Just thought I would share some of the more interesting finds (although not in my collection) Derek Jeter cards from 2009. Some of these cards were mentioned on the blog previously. 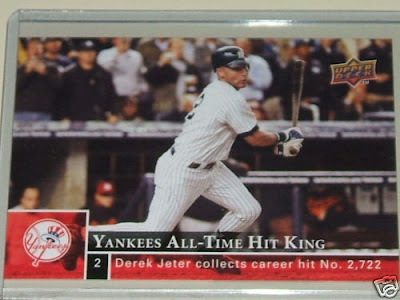 I only mention this card because I am not sure if I have seen a Jeter superfractor. 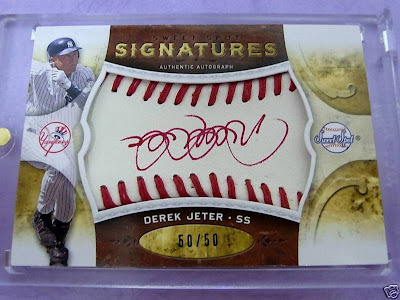 This card recently popped up on eBay with an enormous price tag and went unsold. I know in recent memory I haven't seen a superfractor. Apparently, when it got to the end of the line, Upper Deck workers were a little tired and put in the auto upside down on this card numbered 50/50. I forget the sale price, but it sold for money than the other autos of the group. I wrote about this card and told everyone I was tired of the gimmicks. This coming on the heels of a card that will be featured later. The more comments left and the more they sounded reasonable, this card actually grew up on me. This isn't a gimmicky card, but rather an SP commemorating a baseball achievement. I still don't own it. So this card makes me angry for so many reasons. But the only reason that matters is the Red Sox logo tainting this card. I put this card up because it was my favorite base card of his from this year. I enjoyed ripping open Goodwin and I liked this card because everything is happy in the world. Jeter stands on second base, laughing it up with his friends as he waits for Alex Rodriguez to drive him in. It's a nice spring day with fluffy crowds in the background and the fans cheering him in a brand-new ballpark. It was as though Jeter knew the Yankees would be World Series champions. 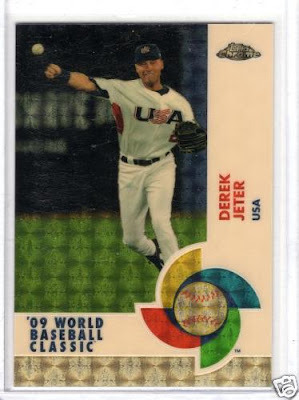 Yes, any Jeter collector would probably love to get their hands on this card. It is his most-coveted rookie card autographed. There are only 93 of them made. This card was inserted into random packs of SP Authentic (I never found any) and fetches around $1,500 or more it on eBay. Hope everyone had a thrilling 2009 with the Card Bandits (that's Marie and me) and 2010 will bring more fun. 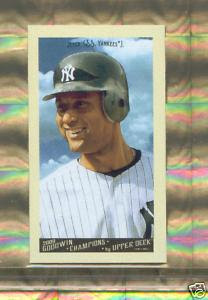 Just for counting sake, my Jeter collection is up 1,458 unique cards. Only 10,000 more to go. Super article! Thanks for giving us your thoughts and insights. We follow your stuff all the time. We have a small site dedicated to card collecting targeting the German and American Friendship communities here in Germany. When you get a chance visit us at www.CardsFX.com we would be happy to join forces in letting everyone know about our great hobby..
Where did the phrase gimmick card come from? They are called variations, and they have been around for a very long time. Why don't certain collectors like them? Its something to chase is it not?